Another Decorative Diamond card for the ONE STAMP challenge - this time in my favourite blues! I started by clear embossing 9 Decorative Diamonds on white card and then sprayed with Colour Chemistry Ink in a Bottle - Spode Blue at the top, then Jubilee Blue with Peacock Green at the bottom. I then blended some Colour Chemistry Pigment Ink in places - Powder Blue towards the top and Forest Green at the bottom. Lastly I ironed the card to remove the embossing powder and make the images pop more. 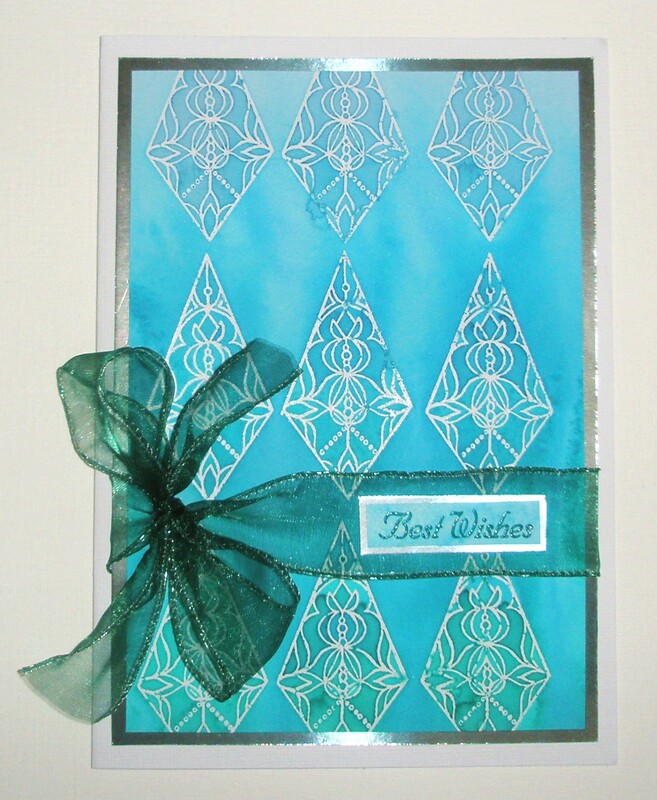 The card is finished with Best Wishes stamped in Forest Green, some green wired organza and silver mirri card. Lynnda will be at the Oak House Studio all weekend crafting for 24hrs with just this one stamp to show how versatile a stamp can be. She'll be stamping on card, wood, glass, metal, silk etc. If you are local (East Yorkshire) you are welcome to pop along to the Studio between 10am-4pm today or tomorrow and join in the fun. Otherwise follow the event online, I will be posting here all weekend, the Design Team have projects to post on the OAK HOUSE STUDIO BLOG and others will be posting on the ONE STAMP page on Facebook.